A lawyer having more that 16 years of experience in Intellectual Property Right (trademark, copyright, design, patent law) based in Hon'ble High Court of Delhi. Represented many brands in Court, viz: L’Oreal, Garnier, Rayben, Lacoste, C.K., Calvin Klein, Correlle, Ray Ben,Skull Candy, Louis Phillippe, Van Heusen, Peter England, Ikea , P.P.Jewellers, St.Ives, Jollen .Inc, Dandi Salt, S.Oliver , Inter Ikea, ,Kamdhenu. Ispat, Ecolab, Pachranga Pickles, India Gate Basmati Rice , Lancome Cosmetics, Polo Ralph Lauren, Calvin Klien, Lacoste, Skull Candy, Peter England, Allen Solley, Fuel, Van Heusen etc. Had been featured member of lawyersclubindia for the month of May 2017-September 2017. Had been regularly briefing matters regularly to Senior Advocates namely Dr. Abhishek Manu Singhavi, Shri Arun Jately, Shri Mukul Rohtagi, Shri Amarjit Singh Chandioke, Shri Sudhir Chandra ,Shri Rajiv Nayar, Shri Neeraj Kishan Kaul, Shri Valmiki Mehta, Shri Chetan Sharma, Shri Harish Malhotra, Shri Jayant Bhushan, Amit Sibbal, Akhil Sibbal, Sohail Dutt, Shri Ranjeet Singh, Smt. Indu Malhotra, Mrs. Pratibha M Singh, Shri Sanjeev Sindhvani etc. Attended the annual conference of INTA (Intellectual Trade Mark Association), held at BERLIN,GERMANY(May 2008). Attended the annual conference of INTA(Intellectual Trade Mark Association), held at WASHINGTON , U.S.A (May 2012). 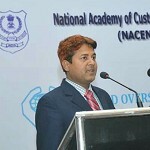 Delivered the Lecture at Custom Law at Erose Hotel, Nehru Place in the year May 2012, in association with NASCEM, Faridabad. Attended Global IP Conference (Organized by ITAG Business Solutions Limited, Kolkata) by held at Bengalore in the Month of January 2013. Delivered the Lecture at Custom at Hotel Tunga Regnenga, Nava Sheva, Mumbai in the year April 2014 in association with Jawahar Lal Nehru , Custom House, Mumbai. Territorial Jurisdiction of a civil court, Vis-à-vis application filed for registration of Trade Mark, in an Action of Infringement of Trade Mark and Passing off (Published in December 2008 issue of PTC), Trade Marks Laws in India (Published on Lex Aspire Journal, Volume 1, No.6, December 2013). Appeared and and argued cases before Hon’ble Supreme Court of India, High Courts( Delhi, Kolkata , Chandigadh, Ahmedabad, Chennai, Mumbai, Bengalore, Jaipur) , Various lower Courts of Delhi, IPAB ( Delhi ,Chennai , Ahmedabad, Mumbai & Kolkatta) , Copyright Board Of India, Trade Marks Registry (Delhi, Kolkatta, Chennai & Ahmedabad ) , National Commission, Delhi, State Commission, Deputy Commissioner of Custom (Surat), Debt Recovery Tribunal, Delhi etc. Suit of infringement and Passing Off related to Trade mark, Suit of infringement of Copyright, Suit of infringement of Design, Opposition proceedings before Trade marks registry, Rectification proceedings in the Intellectual Property Appellate Board, Rectification Petition in Copyright Board of India, Registration of Copyright, Registration of Design, Criminal complaints related to trade marks/copyrights, Acquaintance with procedural part of patent law, Complaint pertaining to Information Technology Act 2000. Complaint cases pertaining to Information Technology Act 2000, Software Piracy and software infringement, handling complaint cases before NIXI. Enforcement of Intellectual Property Rights with the help of Custom Authority in India( Visited custom authority at Sachin, (Surat), Delhi etc.